EL PASO, TX --- Sophomore High School Student Brandon Joseph Kaleikoa Elizares, 16, was by most accounts bright, bubbly and happy. He was comfortable enough in his own skin that he came out of the closet when he was 14 years old. That’s when the bullying started. According to interviews that his Mom gave to the press, Hawaiian born Brandon wanted to be a writer, or hoped for a career in fashion. “Art was very dear to him and I think that it kept him sane. When he first came out, he told me that he had lost a lot of his friends because he wanted to live openly as a gay person and he did not understand. Shortly before Brandon’s death, his life was threatened by bullies. He was told he would either be burned to death, or shot. 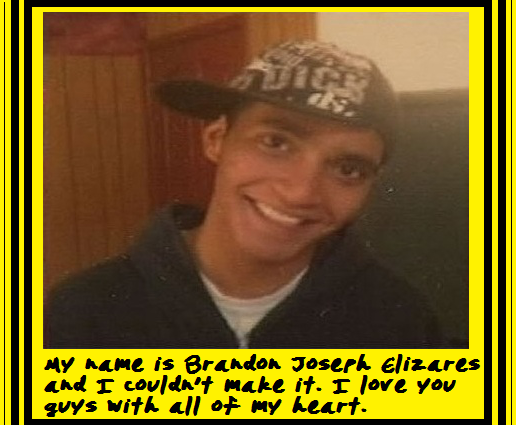 On June 2nd, Brandon went home and overdosed on pills, and was found by his younger brother. You’re in our hearts, thoughts and prayers Brandon. RIP.